The artist Patricia Dauder presents an artistic intervention in Refuge 307, located below the Montjuic mountain, in the Poble Sec neighbourhood. This is one of the few refuges preserved in Barcelona among the more than 1,400 that were built in the city during the Civil War, and the only one currently open to the public on a regular basis. 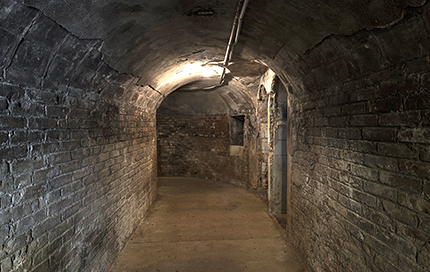 Like many others, it was excavated thanks to citizen cooperation and local effort, exemplary of the passive defence the population carried out to protect themselves from the indiscriminate bombings that ravaged the city from the air. The refuge is also a space that reminds us of the experience of horror and the traumatic commotion caused by war routine. 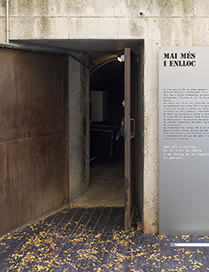 For the production of Ecos, the work Dauder presents within the framework of the programme Compositions: Underground, the artist has started from a selection of archival photographs taken during the Civil War, most of them part of the Photographic Archive of Barcelona. These are images showing the experience of the war in the city, although they do not address the political or military aspects of the conflict; they focus on the architectural spaces and objects instead: burned convents, destroyed buildings, half-collapsed house interiors, prisons…, but also spaces for citizen meetings and recreation. Dauder chooses fragments of these photographs, specific parts, and constructs a visual narration as a Synecdoche, showing almost no people, but details of space and atmospheric elements. The artist configures a personal and intimate approach to the imaginary of war, evocative rather than illustrative, and perhaps inviting us to question the validity of diaphanous and unidirectional historical accounts. 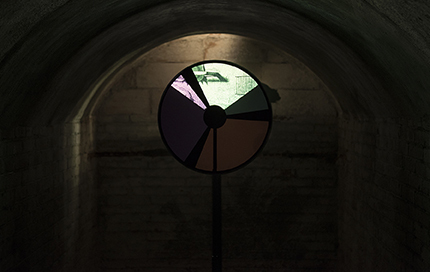 This narrative, articulated in a sequence of 80 black and white slides, is projected on a kinetic sculpture whose top is a rotating piece that functions as a projection screen, and which has colour filters that alter the chromatism of the images. 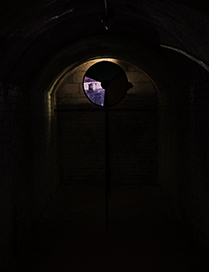 The installation is reminiscent of the precursor artefacts of Cinematographs, such as the Phenakistiscope or the Magic Lantern, and generates an intimate cinematographic experience.